Bien el Lancaster esta incluido no hace falta bajar nada ¿verdad? Que chulo .. no se muy bien como funciona pero debía molar eso de la caza nocturna. Hacia el capítulo 2 creo que lo explican, no obstante es interesante verlo completo. ¿Qué te esperabas, la del A10? 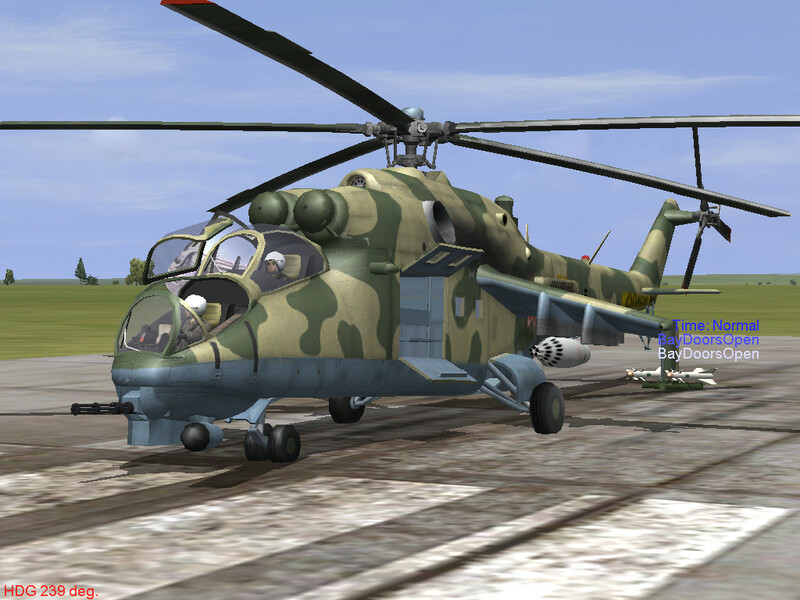 The Mil Mi-24 (NATO reporting name: Hind) is a large helicopter gunship and attack helicopter and low-capacity troop transport with room for eight passengers. It is produced by Mil Moscow Helicopter Plant and operated since 1972 by the Soviet Air Force, its successors, and more than 30 other nations. 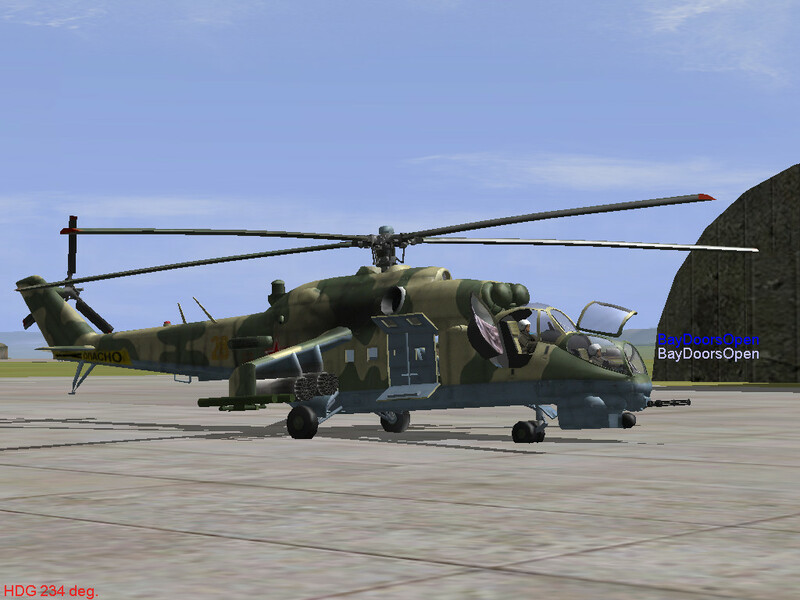 In NATO circles, the export versions, Mi-25 and Mi-35, are denoted with a letter suffix as "Hind-D" and "Hind-E" respectively. 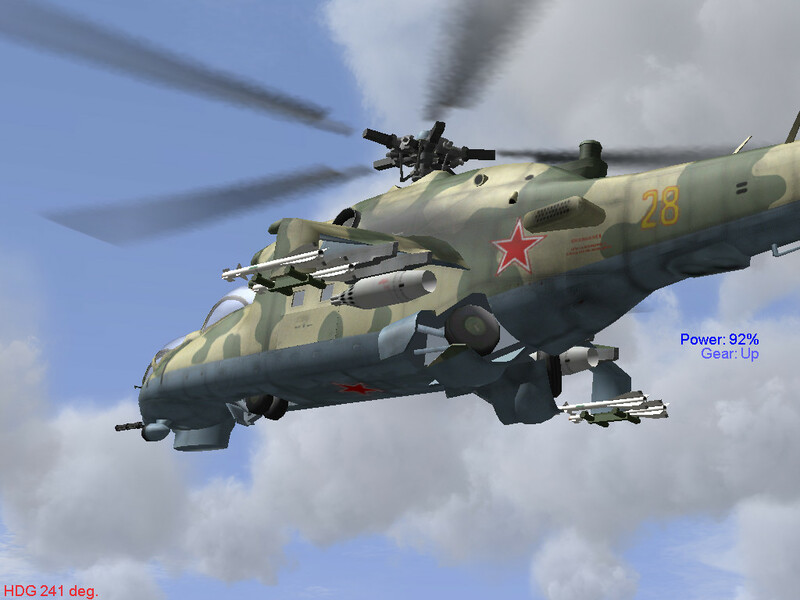 Soviet pilots called the Mi-24 the "flying tank", or (rus. letayushchiy tank). More common unofficial nicknames were "Crocodile" (rus. Krokodil) due to the helicopter's camouflage scheme . Original 3d model was made and kindly donated by Petr005 for inclusion in IL-2. Big thanks to Petr005 for sharing his top notch 3d work with us. This model was donated ONLY for inclusion in IL-2 and it cannot be re uploaded or redistributed or used in any other game. READ THE FOLLOWING INSTRUCTIONS HOW TO INSTALL ! This mod was made and tested on DBW 1.7 installation (Jet War 1.2) along with latest AI Engine Mod 2.6. ---> Also you will need L-159G by GJE52. You NEED TO INSTALL the airplane L-159G ... only then you will have WEAPONS on Hind-E. It includes Flyable version and stationary object .... AI version will come later. Rotor Tilt (idea by SAS~S3): now, like in RL you have your rotor moving along with your ciclic. You can both see and feel the effect. The rotor mesh will be moving when you look at it from external. But the main feature is actual behavior changes. Now you don't need to pitch down that much to fly forward and it helps you to hover better and it also allows you to make something like Flare Landing. Fixed Flight Model: Vega and me were working for some time to fix verious problems with heli flight model and seems result is more or less better then before. Fixed problems with backflipping at take off. So now you can hit 100% throttle if you need to. Hover behavior is also improved and now it is much easier. Fixed the very annoying bug, when your aircraft would suddenly start falling to one side. And there alot of other various little fixes here and there. YakB 12,7 four barrel minigun is operated from the turret cockpit (be aware that it has only 1470 rounds!). S-5M is an unguided rocket with HE warhead. Use it against infantry and lightly armored targets. S-5K is an unguided rocket with HEAT warhead and it can penetrate up to 130 mm of armor. S-8 is an unguided rocket with HE warhead. Use it against infantry and lightly armored targets. S-8KOM is an unguided rocket with HEAT warhead. S-8DM carries a liquid highly explosive warhead and it is equal to 5 kg of TNT. RBK-250 is an antitank cluster bombs. It is filled with PTAB bomblets, so make sure to have enough altitude when you drop it. Sturm-V is a SACLOS radio guided anti-tank missile. Unfortunately in IL-2 we can't imitate this, but you can "guide" your missile using turret cockpit. Missile will track the target that is in center of your reticle. As in real life you need to keep your reticle on the target all the time, before missile hits its (your Sturm missiles are on the "Bomb" key). The Mil Mi-8 (NATO reporting name: Hip) is a Soviet-designed medium twin-turbine transport helicopter that can also act as a gunship. 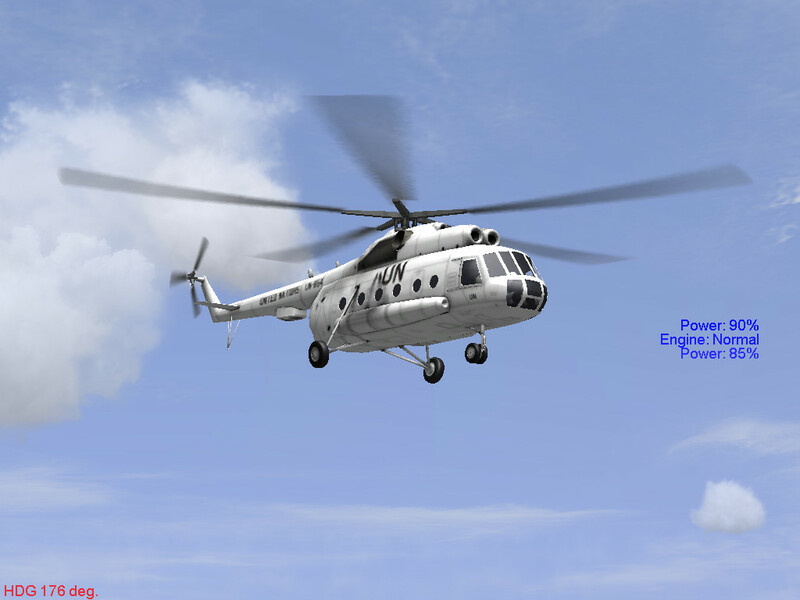 The Mi-8 is one of the world's most-produced helicopter, used by over 50 countries. Original 3d model by Petr005, worked on by Marcfighters. Big Thanks to SAS~Storebror, GJE52 and Loku for advice and help. 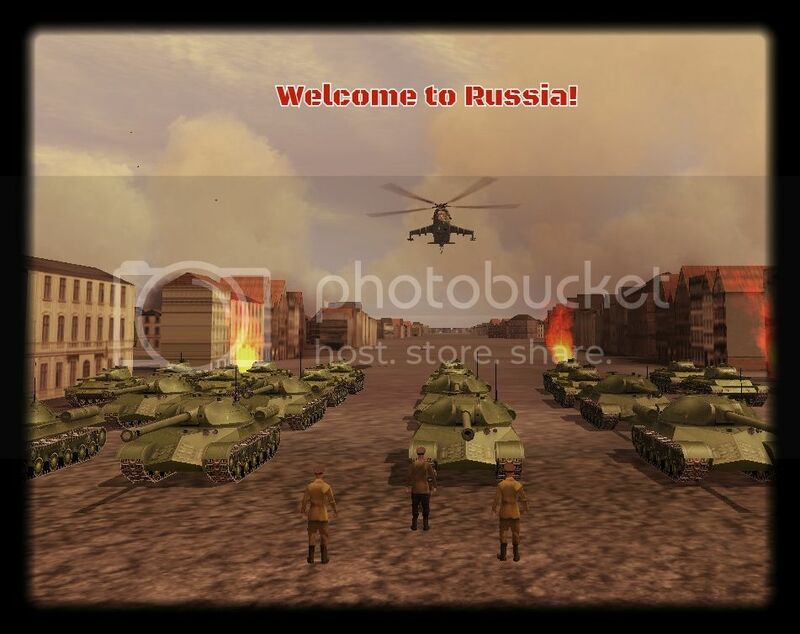 This mod was made and tested on DBW 1.7 installation (Jet War 1.2) along with latest AI Engine Mod 2.6. Also you will need L-159G by GJE52. It includes Flyable version, AI version and stationary object. Finally after years of development we are proud to present the MiG-21PF/PFM/FL package to the Il-2 community. It was begun in approximately 2009 by Sani and CsoCso as a protest to the commonly held belief that modern jets could never be simulated in Il-2. Boy were those guys wrong! With the advent of the Jet Era project, I joined the team to assist in combining the features of both packs. 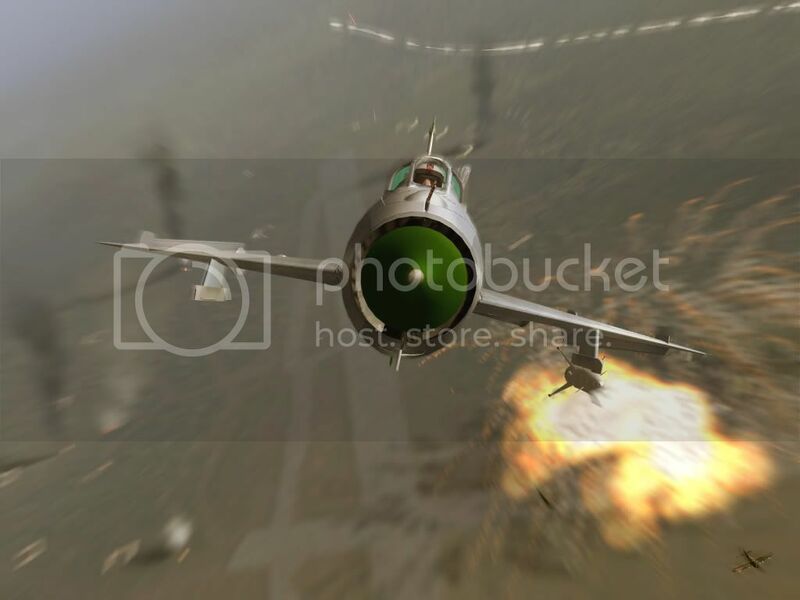 Around this time, Sani retired from modding and the MiG-21 project was placed temporarily on hold. Following the release of the Jet Era v1.1, it was revived again with CsoCso actively working on the 3D, Lisek developing some new ordnance, Lt Wolf on the flight models and myself on the code. At this point, community hype was at breaking point and the team quickly tired out from the excessive demands. With increasing commitments on this site and in real life, all of the team split up for a while and progress slowed. We set prospective release dates but we kept on missing them. Last year though, we had fresh blood injected into the team. CsoCso stepped down, burnt out from the drawn out development process and handed on his work to S3 and Wasted (he still remained on the team as an advisor). They both took it in their stride to bring the 3D and skin work up to scratch respectively. Not only that, they both went on to finish the pre-alpha cockpit and make it fully functional. 4S_Vega, fresh from his experience with modelling the flight models for the F-4 series turned his talents to the MiGs. Wasted assisted with this process and was fortunate enough to have the FMs tested by former Eastern Bloc MiG-21 pilots. In the meantime, RedFox had made some new ordnance and I was well into coding the advance features of the SAS Engine Mod. I used the MiG-21s as a test bed and finally achieved what we have dreamed. I must give a huge thanks to everyone who was involved in the project. Without you, these aircraft would have never been released and would have just been another 'wunderwaffel WIP'. You MUST be running at least 4.101m with SAS Modact 3.06 or later, OR DBW 1.71 OR 4.11.1m with SAS ModAct 4 OR HSFX6. If not, see this thread. You MUST be running Il-2 1956 The Jet Era v1.3 or later, see this thread. You MUST be using Buttons Version 10.1 or later, see this thread. You MUST be running the SAS Engine mod. Otherwise this pack will NOT work. Available Here. - BUT by doing so, you might encounter some errors. In addition many of the features of this pack may not work as intended. - Do so at your own risk! - It WILL NOT run with older versions of JetWar. Download Guide - Compiled by SAS~Anto, Wasted and F22-Raptor. It is included with the pack download, but included here for your convenience. 2) Run the 7zip archive and extract all to your IL-2 DBW/UP/Mods directory. 3) Open the readme file in the Mods/MiG-21 directory. Please follow instructions to add air.ini entries. Also many thanks to all the beta testers at SAS. Edit by SAS~Bombsaway: I am adding Ranwers chute post here so it doesnt get lost in this thread. A fine addition to these great jets. Please specify your mod installation. If you have a crash, and you want us to help you, you'll definitely have to post your logfile, in code format. IF you don't know which parts of the log file to post, simply use search function to find these: anything that related to "mig" "21" and also this "java.lang.RuntimeException". Insufficent bugs reports will be kindly ignored. OTIAAAAAAAAAAAAAAAAAAAAAAAAA!!!!!! nene tere, nene tere!!!!!!!!!!!!!!!!!!!!!! !.